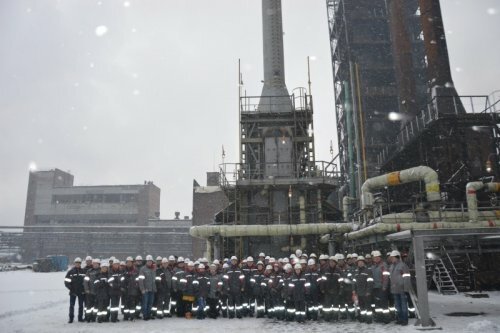 Avdiivka Coke put into operation a high-efficiency tar tube heater that has no equals anywhere in Ukraine. Investments of Metinvest Group amounted to UAH 51 mln. Tar distillation shop is designed for the processing of coal tar. The tubular furnace can process up to 200 ths tons of coal tar per year and will help avoid equipment failures during the operation of tar distillation shop. The furnace tubes are made of quality stainless steel and equipped with combustion control. In case of emergency, the burners of the furnace will automatically be closed off to prevent an accident. Due to modernization, the emissions of the tar heating process will be reduced by 90%. Apart from financing the construction of the new tubular furnace, the enterprise contributed UAH 2.5 mln to the budget of Avdiivka for infrastructure development. - Over the last five years, we have spent almost a billion of hryvnias for modernization of operations and environmental programs. The better we clean gas, the more we earn.Ecology and enterprise economics and, therefore, the cities benefit from modernization.